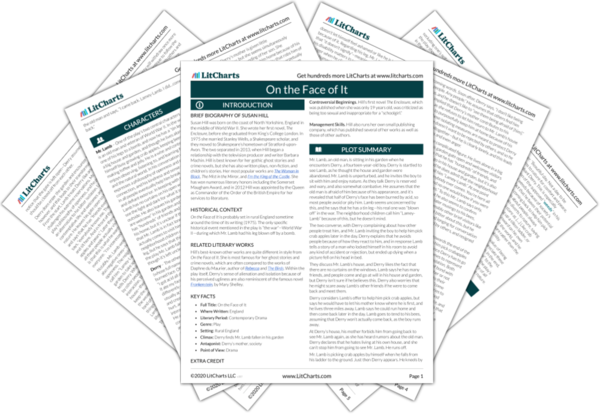 Instant downloads of all 942 LitChart PDFs (including On the Face of It). Welcome to the LitCharts study guide on Colin Dexter's On the Face of It. Created by the original team behind SparkNotes, LitCharts are the world's best literature guides. A concise biography of Colin Dexter plus historical and literary context for On the Face of It. A quick-reference summary: On the Face of It on a single page. In-depth summary and analysis of every of On the Face of It. Visual theme-tracking, too. Explanations, analysis, and visualizations of On the Face of It's themes. On the Face of It's important quotes, sortable by theme, character, or . Description, analysis, and timelines for On the Face of It's characters. Explanations of On the Face of It's symbols, and tracking of where they appear. An interactive data visualization of On the Face of It's plot and themes. Susan Hill was born on the coast of North Yorkshire, England in the middle of World War II. She wrote her first novel, The Enclosure, before she graduated from King’s College London. In 1975 she married Stanley Wells, a Shakespeare scholar, and they moved to Shakespeare’s hometown of Stratford-upon-Avon. The two separated in 2013, when Hill began a relationship with the television producer and writer Barbara Machin. Hill is best known for her gothic ghost stories and crime novels, but she has also written plays, non-fiction, and children’s stories. Her most popular works are The Woman in Black, The Mist in the Mirror, and I’m the King of the Castle. She has won numerous literary honors including the Somerset Maugham Award, and in 2012 Hill was appointed by the Queen as Commander of the Order of the British Empire for her services to literature. 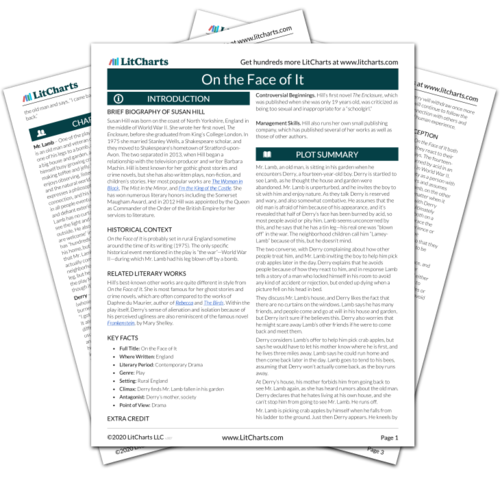 Get the entire On the Face of It LitChart as a printable PDF. On the Face of It is probably set in rural England sometime around the time of its writing (1975). The only specific historical event mentioned in the play is “the war”—World War II—during which Mr. Lamb had his leg blown off by a bomb. Hill’s best-known other works are quite different in style from On the Face of It. She is most famous for her ghost stories and crime novels, which are often compared to the works of Daphne du Maurier, author of Rebecca and The Birds. Within the play itself, Derry’s sense of alienation and isolation because of his perceived ugliness are also reminiscent of the famous novel Frankenstein, by Mary Shelley. Management Skills. Hill also runs her own small publishing company, which has published several of her works as well as those of other authors. Cosby, Matt. "On the Face of It." LitCharts. LitCharts LLC, 28 Nov 2018. Web. 11 Dec 2018. Cosby, Matt. "On the Face of It." LitCharts LLC, November 28, 2018. Retrieved December 11, 2018. https://www.litcharts.com/lit/on-the-face-of-it.